The $150 (as of April 16, 2012) Canon Pixma MX512 inkjet multifunction printer (copy/fax/print/scan) is a bit of a mixed bag. Print quality--aside from color graphics on plain paper, which suffered from an excess of orange--seemed very good. Output speeds were easily fast enough for a home office, and the unit sports Wi-Fi as well as an automatic duplexer. On the other hand, the control panel is inefficient and black ink is expensive. But while its software is nicely designed, the Pixma MX512's control panel has a Rube Goldberg aspect to it--and that's being a bit harsh on Rube's designs, which, though comically convoluted, are not confusing. Among the control panel's foibles are three intermittently used function buttons, an odd-feeling four-way rocker, an inefficient layout that requires too much hand movement, and a keypad whose numbers are backlit only when needed--though the buttons have no other use. The like-priced Canon Pixma MX410 has a far better control panel design though it still suffers from the three dubious function buttons. Still, the 2.5-inch nontouch LCD display is nice to have. The Pixma MX512's paper handling features are adequate for light use, with a 100-sheet paper tray, automatic duplexing, and a 30-sheet automatic document feeder for the scanner. However, scanning is single-sided only. The output tray is oddly designed: It's short, so that paper hangs over the edge and is stopped by the catch extending from the input tray below it. This arrangement works most of the time, but occasionally a sheet printed in the unit's speedy draft mode will sail to the floor. The Pixma MX512 uses Canon's 240 and 241 series ink cartridges. The PG-240 and CL-241 cartridges that come in the box are very low-capacity--delivering just 180 pages apiece--and they are currently not for sale in the United States. The replacement black ink costs are well above average, but replacement color can be relatively affordable. The PG-240XL Extra Large black cartridge ($21) lasts for 300 pages, which works out to a pricey 7 cents per page. Meanwhile, at 6.3 cents per page, the 600-page PG-240XXL ($38) black cartridge isn't much cheaper. The unified-color (three colors in one cartridge) CL-241XL costs $30 and lasts for 400 pages, or 7.5 cpp. Added to the XXL black that comes to a relatively affordable 13.8 cents for a four-color page. Of course, the cost per page will increase if you don't use the three colors evenly, as you must replace the unified-color cartridge when one of them runs out, even if plenty of the other two colors' ink remains. If you've read PCWorld's other Canon inkjet reviews, you won't be surprised to learn that our test prints of the Pixma MX512's color graphics had an orangish tint. This emphasis adds warmth to many subjects and the effect is quite subtle on glossy photo paper, but on plain paper the spray-tan look that some human faces acquire can be annoying. Black text looked excellent--crisp and sharp--as did monochrome graphics, though the latter had a purplish tint on plain paper and bordered on sepia with glossy paper. The Pixma MX512's speed won't take your breath away, but it usually won't have you drumming your fingers in anticipation, either. Monochrome pages (text and some graphics) print at nearly 7 pages per minute on both the PC and Mac. Normal-size photos printed at 2.6 ppm on plain paper and 1.1 ppm on glossy paper. Full-page photos took 4 minutes to print, which is rather slow even for a low-cost MFP. Our test scans and copies posted times that were a little faster than average. 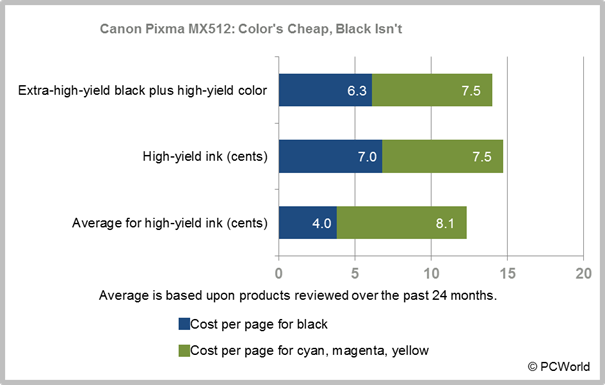 Canon makes some very nice multifunction printers, but the company's efforts to reinvent the control panel make the Pixma MX512 more irksome to use than it should be, and the pricey black ink will cut into your bottom line. The Brother MFC-J825DW has the same selling price, but offers cheaper inks and more features. This competent, low-volume multifunction printer offers good output and speed, but costly black ink and some design oddities are drawbacks.